Which movies make the most money at the box office? But, perhaps not surprisingly, the best money spinners are the animated family movies such as Toy Story, Shriek, Frozen and the like. This is a billion dollar industry with billion dollar returns on investment for those perceptive individuals with an eye for a good return. Animation has come a long way since the first revolving drum pictures were created in the 18th century. The invention of photography in the early 20th century delivered huge advances to the techniques of creating animated images. The first full-length silent animated film, featuring Mickey Mouse, was released in the early 1920s. The first synchronised sound animated film, Steamboat Willie, was released in 1928. Each Animated movie returns at the box office approximately 4 times its budget, ranging from a break even to a ratio of 13.1 times its budget in the case of Shrek 2. Five of the highest grossing digital animation movies are Frozen (2014), Toy Story 3 (2010), Finding Nemo (2003), Despicable Me 2 (2013) and Shrek 2 (2004) with worldwide gross at the box office ranging from $918 million to well over $1.25 billion. This does not include other revenue sources, such as home video/DVD sales, television, merchandising or non-theatrical releases. Three main factors account for the strong performance of digital animation feature films. On average, up to 2,000 films are released worldwide each year. Relatively few of these films however, are appropriate for family/ children. By contrast, on average only 10-12 animated feature films are released each year worldwide. Yet these consistently produce the best returns for any movie on average. DVD sales of animated feature films continue to attract high consumer demand. In the USA alone, G and PG rated animated films feature 16 times in the top 50 DVDs sold in 2010, generating an income of US$805 million. The advent of downloading pay per movie is now a stable source of revenue for the studios. 3D digital animated feature films traditionally introduce characters and themes with enormous appeal to children that has been a source of consistent profitability. For instance, merchandise tied to the 'Cars' franchise has generated global retail sales of more than US$8 billion for Disney for Cars 1 and has already exceeded US$10 billion after Cars 2. 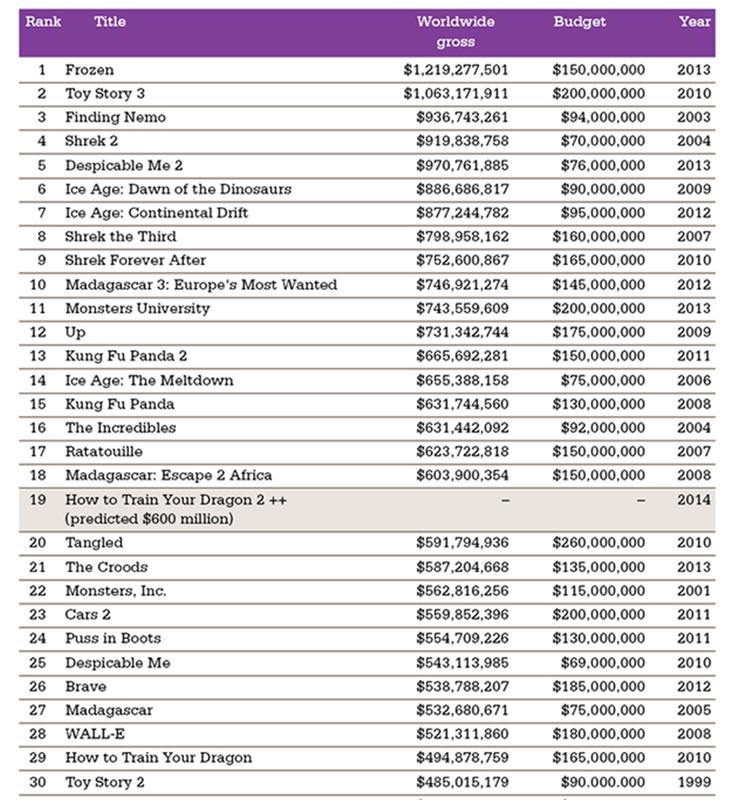 The following chart is a list of the highest-grossing computer-animated films produced by Pixar, Disney, Dreamworks, Sony, BlueSky, Illumination and distributed by Disney, Dreamworks, Fox, Paramount, Universal and Columbia. 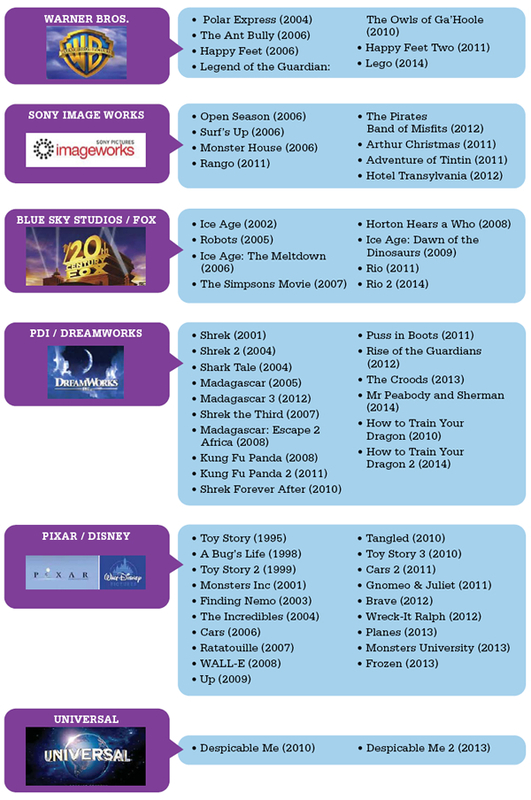 Between 1995 and 2008, 40+ major digital films were released. This figure increased between 2008 and 2012, with more than 40+ major digital films released over just 4 years. The global market remains buoyant, with no sign of saturation, delivering healthy profits to investors. In the animated movie industry, there are 6 main competitors, with not one company dominating the industry including Paramount and Universal now joining the mix. 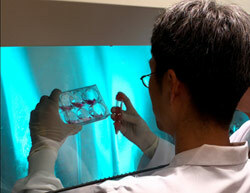 In total, there are less than a dozen major and emerging companies in the industry. This leaves a tremendous scope for any new movie company to enter the field. Into this profitable arena comes East West Private Equity Pty Ltd. East West will produce 16 3D Animated Stereoscopic Family Movies and sequels in Australia where there are significant tax advantages in the movie industry. East West will also aggressively pursue opportunities to license its content to marketers of apparel, footwear, video games, online games, toys, books and sporting goods. All opportunities will be pursued in line with film development. Television, games and short form potential will be exploited at the discretion of East West in the lead up to the release of the first movie. This includes promotional tie-ins with food outlets and packaged-goods companies. These offer the dual benefits of incremental revenues from licensing royalties and additional advertising exposure. Making a fully featured movie, even an animated one, takes a lot of finance and the costs, as can be seen in the chart above, are quite significant, in the hundreds of thousands if not millions of dollars to fund the production. Fortunately, the Australian Government has legislation that allows for a potential 40% production rebate of approved film expenditures and to date over A$800m has been credited to this program. East West's first objective, during the investment phase, will be to line up as many of its slate of 16 movies (with sequels) to gain preliminary certification under this program. This is not an offer for investment to USA citizens or their representatives.